You can view your preferences by clicking on the "Preferences" link. For example on this site it is available at the bottom of the page. 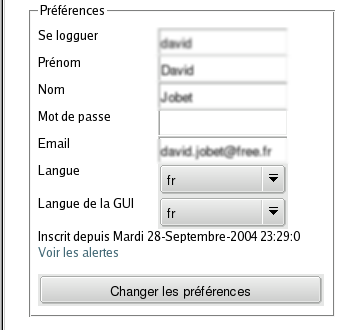 It will display a form showing you your current preferences. These are basically the same field that were asked to you when registering. You can change your login, your password, your email adress, your first and last name and your preferred langs.